We all know that brushing our teeth well and regularly is a key step in staying as cavity free as possible, so as to avoid tooth filling and other dental work. However, have you considered that keeping your toothbrush clean and germ free is also important? Here are a few simple tips for keeping your toothbrush clean. • Use mouthwash prior to brushing your teeth. Mouthwashes are antiseptic and are intended to help eliminate bacteria from your mouth, so if you rinse your mouth with mouthwash before you brush your teeth, you lessen the chances for as much bacteria to end up on your toothbrush. • Rinse your toothbrush after brushing. Really rinse it – in clean, running water from the tap, not by jiggling it around in the glass of water you’ve just drunk from to rinse your mouth. Use your fingers to flick the bristles to make sure any food particles are removed. Make sure it can dry thoroughly between uses. • Use separate containers rather than a communal one. 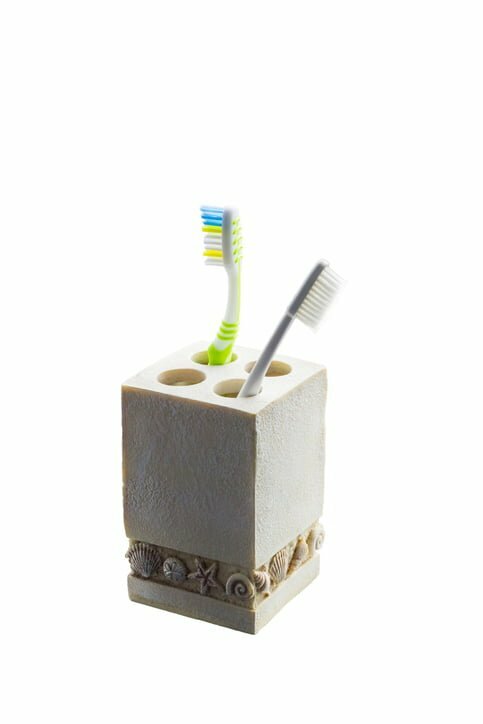 Storing your toothbrush in a communal container means there’s a possibility of cross-contamination from other people’s toothbrushes. So rather than having a family cup to drop them into, perhaps consider having a separate cup for everyone’s brush. • Don’t store your toothbrush in the medicine cabinet, bathroom drawers or any closed containers. Cool, dark, damp places – such as the insides of bathroom cupboards – are prime places for microorganism growth. It’s much better to keep your toothbrush in the open air where it can dry properly after use. • Replace your toothbrush after you’ve been sick. This will minimise the possibility of you becoming reinfected. • Replace your toothbrush every three to four months. The bristles wear down and become less effective when you brush eventually, and as they bend and fray, they can potentially harbour more bacteria. • Don’t share toothbrushes. To a point, you’ll tolerate your own bugs, but other people’s germs may pose more of an issue. Only use your own toothbrush and keep it in good condition. If you do a search online for information about keeping your toothbrush germ free, you may find some suggestions like putting it through the wash cycle in the dishwasher, or rinsing with mouthwash or rubbing alcohol. In general, dental associations don’t endorse these practices, as it has been found that they don’t make a great deal of difference, and can damage also the toothbrush. Cleaning your teeth should be a regular part of your routine. Adding the care of your toothbrush to that routine won’t add a lot of extra time and will help you keep it in top condition.